Our training premises are part of the modern administration centre. 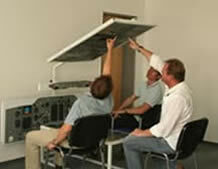 The training classrooms are equipped with sophisticated technology (e.g. Media Boards, PCs). You can walk straight from the hotel through the building to our classrooms and you have the oppartunity to use the classrooms all day.